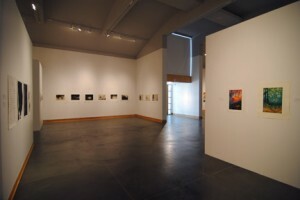 There are few more days before the Okanagan Print Triennial (OPT) closes at the Kelowna Art Gallery on June 17th. I had a chance to chat with one of the OPT instigators, artist and UBCO prof Briar Craig, to learn more about how the show came to be, what to expect in the show, and what’s happening in printmaking right now. KB: So what can people expect to see this year? And what are you particularly tickled by? KB: Who’s on the jury? BC: Myself, Lubos Cullen [the Curator at the Vernon Public Art Gallery] and Liz Wylie [the Curator at the Kelowna Art Gallery]. I think in the 3rd or 4th incarnation of this show, we’ll invite another jury member, but for now, we’re the core. I thought the work submitted this year was a strong group of work. Nothing really stood out though, but there was really good work there. I was pretty happy with how things went. But when we saw the real stuff, like prints by Liz Ingram that are 9 feet long, unfurled in front of you, that changes things a lot. KB: How do you even make a 9 foot print if your press is only a certain size? BC: In sections. She often prints on rice paper and pieces them together. It’s still a continuous image and the joins are perceivable, but they’re not distracting. They’re actually quite arresting pieces and they’re very dense. When you see them, you don’t think “oh there’s a light weight print” that feels like it’s just been fashioned together. It feels like a whole other experience; often of water. So it feels like there’s a real sense of depth in the work. It’s dark and brooding. What we’re trying to do with the Okanagan Print Triennial is different than most biennials and triennials. We’re accepting fewer people and showing a body of their work. So instead of a single piece by 45 people, we’ve got work by 20 people and some of them are showing up to 6 or 7 pieces. KB: So which gallery is this at? BC: At the Kelowna Art Gallery. 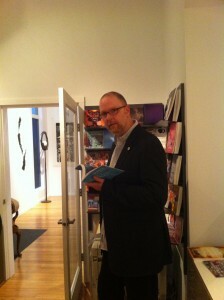 Vernon is, of course, looking for a new gallery. 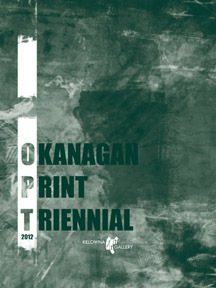 So sort of the rallying cry around that is having the 2015 OPT (Okanagan Print Triennial) as the inaugural exhibition. For me, that’s lovely that they’re using that as something to aim for. 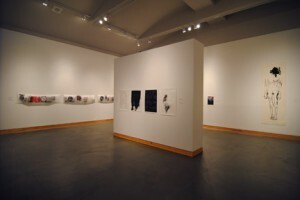 KB: So beyond you’re obvious love of printmaking, what was the impetus for creating the Okanagan Print Triennial? BC: I’ve been showing internationally for years and I appreciate that there are these opportunities. So really, the first impulse was if other people have been doing that and I’ve been able to capitalize on it, then I’d like to be able to do something for other people and make this a bit of a hub for print as well. It’s really corresponded to a bit of a renaissance in interest in printmaking, even in the BFA program. There’s suddenly a bunch of printmakers that we haven’t had before. There’s a kind of groundswell. So OPT came up at a really great time, where students can really see what is possible and what’s happening internationally. KB: So are there other print hubs in Canada? BC: Yes, Edmonton. The U of A (University of Alberta) has one of the most recognizable print programs, maybe in North America. There was a real meeting of minds there and the faculty really worked to get on the map – to bring people there and send people out. Toronto has one too, just because of Open Studio, which is probably Canada’s largest print co-op. There’s also a few million people there, so you’ve got more interest. Halifax also has a good print scene as well. KB: So it does stretch right across the country. BC: The other big biennial is in Trois Riviere – Quebec is quite good for print too. We’re kind of following their lead, which was to show a body of everyone’s work. KB: So why do you think there is a renewed interest in working in printmaking, especially in this digital age, when everything could be done on the computer? BC: I think it’s not so much a coming back to this process. All the print processes came from something industrial, even etching came from the ability to recreate drawings and paintings and send them out into the world. They were never really thought of being for artists, but then artists got in there and started thinking about how to use the means of reproduction to make their own images and send them out into the world. Lithography was created as a way to reproduce sheet music or plays. So it wasn’t really destined to be about imagery, but then artists, like André Daumier, got a hold of it and you could suddenly reproduce a drawn image, with all the characteristics of a drawing and put it in the newspaper. So now as all these digital things come in, printmakers are looking at them and saying “we could use that”. KB: Using it in what way? Putting in back into a more traditional medium or a combination? BC: Creating new hybrids. It’s coming back into the traditional processes, but it’s also created new things. 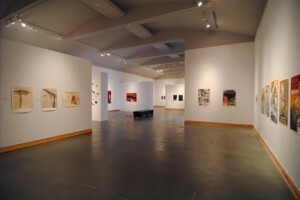 The Okanagan Print Triennial closes on June 17th at the Kelowna Art Gallery.